CPR Steamship Terminal Building - Historical Places of Victoria, B.C. Built in 1926, the Canadian Pacific Railway (CPR) Steamship Terminal Building is another iconic building in the Victoria Inner Harbour. 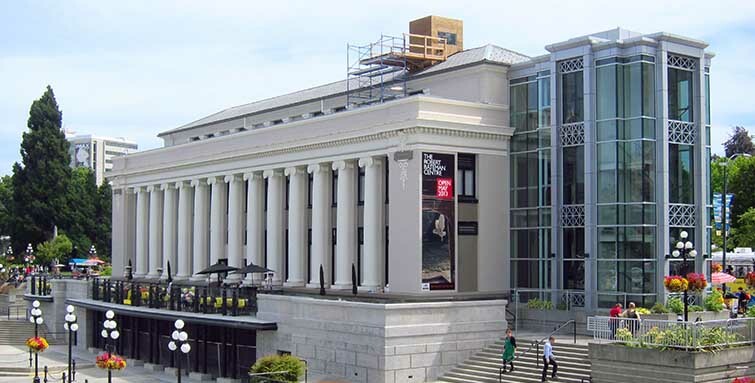 Unlike the Empress Hotel and Legislative Buildings, the CPR Steamship Terminal is distinctly Neo-classical, with large columns and Ancient Greek iconography that keeps a watchful eye on the habour. Despite sharing the same architect as the Empress and Legislative Buildings, Sir Francis Rattenbury, with assistance from his then partner Percy James, the Steamship Terminal is unique in the Victoria cityscape. This is easy to note, as concrete building techniques were used to create the temple-like building, which playfully pays homage to Greek temples of Poseidon, the God of the Sea. The cherry on top is its prominent location: waterfront overlooking Victoria’s stunning Inner Harbour. It added a distinct element to the already majestic harbour, which helped solidify Victoria’s status as the capital of British Columbia, and the heart of tourism. It’s easy to see how breathtaking the building would have been for those stepping off of their steamship and into Victoria for the first time. The CPR Steamship Terminal building witnessed passenger traffic grow from a mere 11,000 passengers on the route, to almost 150,000! By 1960, however, the times had changed and gone were the days of the CPR Steamships. In 1970, the now empty building, with its soaring, ornate ceilings, elegant lounges and rich fireplaces was converted into the home of the popular Royal London Wax Museum: Madam Tussaud’s. Four years after the museum took over the building, Canadian Pacific Steamships terminated their passenger service, selling the building to the Province of British Columbia in 1975. Madam Tussaud’s was one of Victoria B.C.’s most popular tourist attractions on the harbour. It held its scenic spot for fifty years, delighting visitors and locals with its realistic wax displays. In 2010, the museum officially closed its doors, as the Province received a $3.1 million infrastructure grant. They used this to restore the Neoclassical details of the impressive building, and for seismic reinforcements of the then 84-year-old structure. Post-renovations, new tenants for the iconic building were sought, and the Greater Victoria Harbour Authority took over the head lease. In turn, they searched for a tenant of the unique building, successfully finding a fitting renter as equally impressive as the fantastic building. The Robert Bateman Centre found its new home in 2016, adding its mark to the historic building on the harbour. Of course, playing host to an art gallery, as well as a restaurant/taphouse and Starbucks Coffee, the CPR Steamship Terminal Building looks entirely different inside compared to its days of greeting steamship passengers. However, details do remain, and the outside is just as impressive as it once was. This is thanks to the efforts made to revitalize the building and keep it fulfilling its duty as a grand welcome to those visiting Victoria’s downtown Inner Harbour. Take a seat on its sweeping staircase and enjoy the intricate designs and figures of the building, or dine under its 17-foot high ceilings to gain a sense of appreciation for its size and detail. At night, its colourful lights add their shine to the sparkling bulbs of the habour’s boats and the Parliament Buildings.